There’s something a little funny about the full page ad in this week’s Eye for Joshua Jackson’s new cross-Canada motorcycle movie One Week. Rather than the words of wizened critics, the ad features a page full of quotations from people who seem to have not actually seen the movie. “I am definitely going to watch this!” says one; “It’s going to look amazing on the big screen!” says another; “I agree this looks like a great film” writes a third. 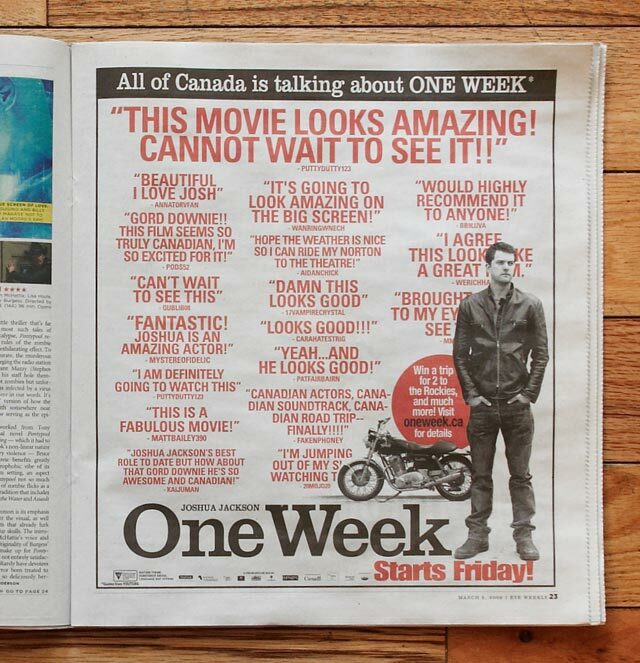 “All of Canada is talking about ONE WEEK*” the ad’s copy exclaims, and—hey, wait, what’s that asterisk for? Oh yeah: every single bright-red quotation on the page, lauding the film and its actors, is one of the ninety-three YouTube comments on the film’s trailer. …aaannndd every comment we could find is attributed to the wrong YouTube user. There you have it. Go see One Week! 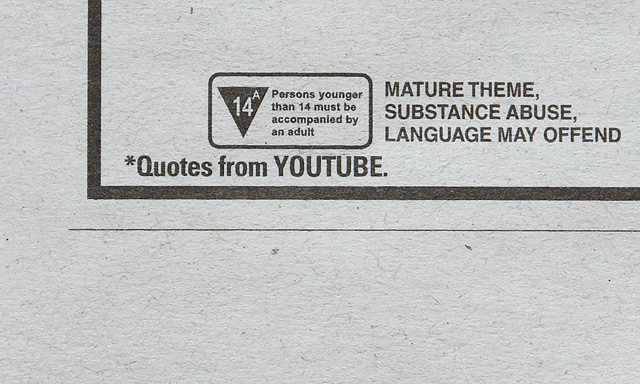 It’s the film whose trailer no more than 1 in every 360,000 Canadians have left a YouTube comment about.